So imagine a place that only takes in 12 students to teach them even more once they have reached their potential at university. The best of the best and cream of academic greatness. 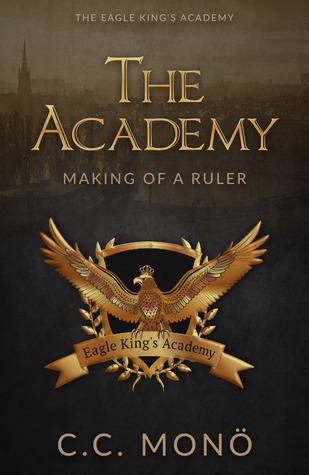 Well the Eagle King’s Academy is such a place, it is unique, it is where leaders are moulded to rule the world. It felt like I had entered an adult version of Harry Porter but it had lost its magic element of wands and wonder and instead these chosen few had cutting edge technology for their bidding every day. Only the best for the best. Axel at 22, had only ever pushed himself because of a promise that had been made to him but now those goal posts had been moved again. Axel never wanted things to go this far. He didn’t only have one of the brightest minds at the Academy, he also had a mind of his own that he intended keeping that way, not to be bent into something that someone wanted. Axel could be living on borrowed time, this type of thinking had happened once before and that year only 11 students graduated. This is a super start to a new series, especially as it is a debut novel too. Although there is a tense setting I felt that this book is more the cement for the rest to be built on. The story follows a couple of time lines, that of Axel and that of a former student Sarah, 9 years previously, both of them having similar approaches to the school and its teaching methods. I got to know the other students and which are key players to how this story and further stories may develop. Then of course the tutors where there is definitely more to them then meets the eye. A rock solid beginning. I was born in Stockholm, Sweden but grew up in Kenya, Tanzania and Zimbabwe. Gained a Master’s Degree in International Relations at Kent University in 2004, and have been interested in followership since 2007. I’ve done a lot of things – from driving underground trains, to working within the financial sector. Don’t worry, I won’t bore you with any details. I live in Stockholm with my wife and two daughters. Ever since I was a kid, I’ve loved stories – both to read and write them. Fantastic review Susan! I have been dying to read this; had no idea he was a TBC author!